JUNE 18--The notorious Mail Slot Urinator has been arrested, according to Arizona cops. 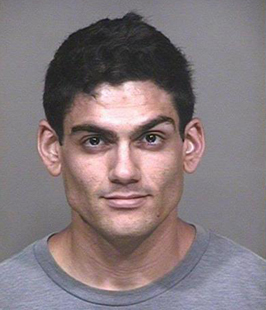 David Azari, 30, was collared this morning by Scottsdale police for allegedly urinating into the upscale Atelier kitchen and bath showroom on June 3. Azari was charged with misdemeanor counts of criminal damage, disorderly conduct, and urinating in public. As seen above, a surveillance camera inside the business recorded a male suspect--who was walking an unleashed dog--stopping in front of the store. After unzipping his shorts, the man proceeded to urinate through the firm’s mail slot, soiling “a rug and the delivered mail just inside the front door to the business,” police noted. Azari, an Iraq War veteran, heads security at Rockbar, a bar/concert venue directly across the street from the crime scene. Atelier is owned by Steve Johnson, who lives upstairs from the business. For several years, Johnson has contacted police and filed complaints about excessive noise and vibrations emanating from Rockbar. Recently, Johnson and other local business owners successfully opposed a move by the bar to extend a particular city permit. Johnson told TSG that he expected some kind of retaliation for his opposition to Rockbar. Upon discovering that someone had urinated into his business, Johnson said that he “knew it was a targeted incident.” Rockbar’s co-owner, Alex Mundy, did not return a TSG call about Azari’s arrest. Azari, seen in the above photos, was booked into the Scottsdale Jail, from which he was later released.